Synthetic Biology: Engineering, Evolution & Design (SEED) is a conference that brings together professors and like minds from the world of synthetic biology. It features multiple sessions focusing on advances in science, technology, applications, and related investments in the field of synthetic biology. Reshma Shetty will be a keynote speaker at the SEED 2019 Conference, where she will discuss the importance of biological design and her work building a genetic engineering foundry at Ginkgo Bioworks. I spoke with Reshma about her work and the importance of advancements in biological design. In your opinion, what is the most important current trend in synthetic biology? 1.) Biology is fundamentally programmable. 2.) We're seeing exponential improvements in the technologies that underly the engineering of biology. When you combine programmability plus exponentially improving technologies, you tend to see outsize, disruptive outcomes akin to those in computing over the last 50 years. What specifically will you be talking about at the conference? Biology is the most powerful technology on the planet. It’s ability to self-repair, self-replicate and make atomically precise structures is unparalleled among manufacturing technologies. At Ginkgo, we are passionate about harnessing the power of biology by designing it. Unfortunately, despite significant advancements in recent years, the tools and technology for biological design remain woefully inadequate relative to the potential of biological technology. Our limited understanding of how biology works means that, for now, biological design is essentially a search problem. At Ginkgo, we are leveraging automation and software to build a genetic engineering foundry that allows us to more cheaply and scalably search potential biological design space for functional organism designs. In particular, I will highlight the value of combining computer-aided engineering software tools, cheap gene synthesis, and high resolution-accurate mass LCMS to develop engineered microbes. Finally, I’ll touch on how our foundry allows us to address opportunities across markets — from chemicals amd enzymes to agriculture to pharma. What message would you like the audience to take away from this year's SEED? At a time when folks in computing are bemoaning the possible end of Moore's law (the exponential improvement we've seen in semiconductor technology for the past ~50 years), biology's Moore's law is just beginning. How do you envision synthetic biology advancing some of the Grand Challenges in engineering and society? Biology has the potential to offer us "living medicines" to treat and cure disease, offer new approaches to provide fixed nitrogen to crops, and remediate the environment. The 2019 Synthetic Biology: Engineering, Evolution & Design (SEED) conference will be held in New York from June 23-27, 2019. Learn more and register today. 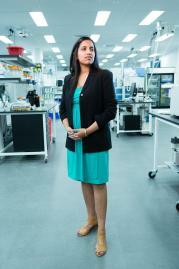 Reshma Shetty co-founded synthetic biology Ginkgo Bioworks, Inc. in 2008. Spun out of MIT, Ginkgo’s mission is to make biology easier to engineer. Started in a Cambridge, MA apartment, Reshma has helped to grow the company to 200 people and raised $450M in financing. In October 2018, Ginkgo launched Bioworks4, its fourth generation facility for design, fabrication, and testing of custom-designed microbes. Ginkgo is concurrently engineering more than 50 organisms to spec for customers including Ajinomoto, Cargill, and ADM. Reshma Shetty has a B.S. degree in Computer Science from the University of Utah and a Ph.D. in Biological Engineering from MIT.